Marine Ecology and Fishery Sciences, Ph.D. 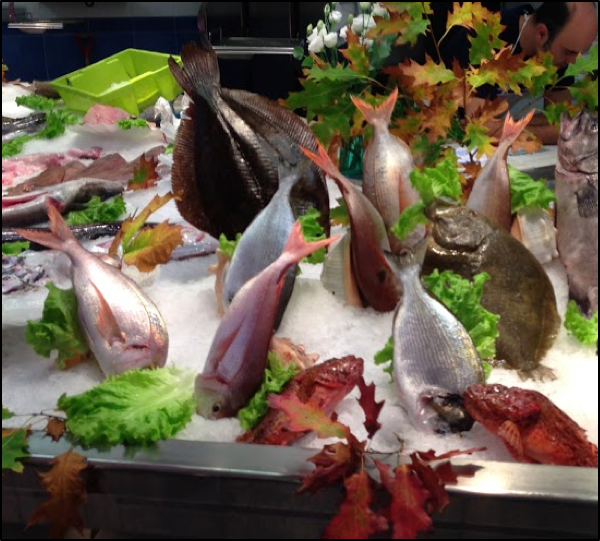 SEAFOOD FOR THOUGHT: What fish should I eat? The filet is the perfect salmon color, with strategically placed grill marks and chutney to die for. The smell and taste are even more transcendent. The restaurant had prepared one of the best salmon dishes I had ever eaten. However, before my fork even touched my mouth I had done something I think few people do: I Googled the type of fish I was eating. It was a sustainably farmed Atlantic salmon from Skuna Bay, Canada (Global Aquaculture Alliance Best Aquaculture Practices certified). As a marine and fisheries ecologist I have an invested interest in my seafood, and sustainability is the name of the game. Now, I literally got a degree in the matter, so when people ask me – and it happens at least once a month – “What fish should I eat?” it pains me that I don’t have a simple answer. Of course, I can dive into the numerous eco-labels that tout ‘sustainability,’ which can come to mean many different things depending on the certification criteria. Or, I can pontificate about not really knowing which stock (i.e., genetically distinct and/or managed population) or farm the fish is from; especially since most (~90%) of our seafood we consume is not from the United States. Fundamentally, these details are important, but I think it ends up causing bewilderment and/or apathy in choosing seafood, which results in stymied change in the market for sustainable products. 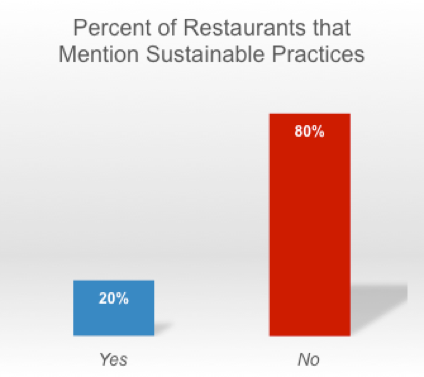 Focusing on the restaurant environment, I think support for sustainable seafood needs to be, initially, abridged by consumers simply asking for some evidence of sustainability and restaurants being transparent about their practices. I came to this conclusion based on my current research efforts, my personal appetite for fish and love of restaurants, and my own curiosity around the sustainable seafood in my area, Santa Barbara, California. After eating at one of the most openly sustainable (and delicious) seafood restaurants in Santa Barbara (Kanaloa Seafood), I wondered how many other restaurants provided the same transparency. So, being the nerd that I am, I spent the weekend researching and compiling data on the top ‘Google’ and ‘Yelp’ seafood restaurants and whether they provided any indication of sustainable seafood practices. After a few hours of digging, I had evaluated 20 different establishments. Although not an exhaustive list – I do have a scientific-fish day job – I was disappointed to find little to no mention of efforts to serve sustainably caught or raised seafood (Fig. 1). In fact, only 4 of the 20 restaurants mentioned ‘sustainability’ anywhere on their website, and only 3 of those 4, Kanaloa being one of them, provided any details about their standards. Some of these restaurants might very well buy and serve sustainable fish. In fact, on previous dining occasions at two of the restaurants I was verbally told they bought sustainable, but I had to make a concerted effort to find out and few details were offered. How can a patron make informed decisions if they don’t even know the options are out there? Figure 1. Results of twenty Santa Barbara, CA restaurants providing evidence on their websites of sustainable seafood. The current seafood standards in Santa Barbara may seem somewhat bleak, but there is optimism to be had. Groups and organizations like Local and Seasonal Seafood Program and Salty Girl Seafood, Inc. are setting the stage and creating the market for sustainable options from our oceans. Moreover, grocery stores around the area do sell sustainable options. My beef (or seafood?) is with the amazing restaurants in the area that could be a mechanism for more information and change. In the bigger context, caring about sustainability most certainly varies at the city, state, and country level. I moved from Seattle, Washington where people and the restaurants take their fish very seriously. In my new town that I’m starting to love, I simply want to see some of the lessons from my field of research align more prominently in the public. Our oceans may be our best option to feed the projected population of 10 billion people, and how the fish were caught or farmed has huge implications for the environment. So, the next time you look to dig into that delicious seafood dish, ask your waiter, “Is this sustainable?” It’s a really good place to start.